RC is now 36 1/2 months old and has just experienced some pretty amazing things this week. As of today he has completed his 27th ride. We started our week out at Heidi's ranch on Tuesday riding RC in the round pen working on transitions. We are really beginning to get a feel for each other and every time I get on him I feel more confident and comfortable. While I am not as savvy as Matt, his trainer, he is beginning to be more comfortable with me as well. Wednesday we headed over to a cattle ranch that Matt works at to introduce RC to some new things. I got the opportunity to ride Rosie;one of Matt's horses while he rode RC. When we arrived there was lots of activity going on. Carpenters working on buildings, someone loading firewood into a truck, chickens and dogs every where. Ranch hands moving bulls from one area to the next and a herd of unknown horses. RC was on a bit of sensory overload when he got off the trailer. 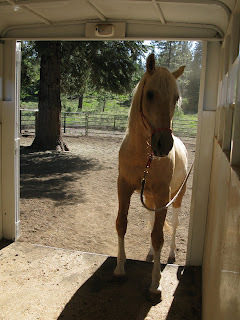 Matt took him while I got Rosie ready and off we went out into the pastures. The first new and exciting thing for this young horse was sagebrush. Now it was a little surprising because his corral is surrounded by the same kind of sagebrush. He quickly got over that and out the gate we went and came to our first obstacle to go through. It was not a large creek nor was it deep and Rosie and I went into it and stopped in the middle. RC took a few moments of hesitation and with Matt's guidance walked through it and off we went. Matt and RC went up and down some boggy embankments and flirted with more water. We picked a nice place to cross the creek again and RC went through it like he'd been doing it all his life. Once on the other side we went into a pasture with some cows so he could learn a bit about them. At first the calves were more interested in RC the he was of them and with the support of Rosie and I(well more Rosie, its been years since I have worked any cows)he quickly became interested and off he and Matt where to separate and move some cows. I enjoyed watching Matt introduce this young colt by encouraging him to move them and then giving some positive reinforcement each time just as much as I enjoyed watching my horse develop self-confidence in what he could do. The next thing I knew he was holding his head relaxed with soft eyes and a eager look of "lets do it again Matt!!!" He walked back to the barn with such pride. The other very interesting thing for me was to see the horse that was riding with us, start picking up her pace as we headed home and Matt mentioning that RC didn't know we were headed home and therefore didn't pick up his pace. I spent a lot of time thinking about that and how horses learn that with time and how I can prevent him from every starting that "gotta get home quick" attitude. That night Matt loaded Rosie and RC up and headed off to another ranch a few hours away to begin work early the next morning gathering and sorting cattle. RC worked for 3 hours giving Matt everything he's got, earning himself a very nice afternoon standing tied and resting. Friday was another morning of working hard and this time even better and more eager to sort and move the cows Matt felt needed to be moved. At the end of the day Matt loaded up and came home. Saturday afternoon when I arrived to pick him up he was a tired boy and seemed somewhat indifferent to seeing me. Looked a lot like a kid who just came home from summer camp and was exhausted. Matt was very pleased with the abilities of RC and has stated that he would take him again in the future. Of course I am the proud mom and will let him continue to learn and grow with Matt. This afternoon RC and I joined my neighbor and her mare for our first ride into the forest. RC was still a bit tired but still ready to go and see what we had in mind. We went out the back of my property with RC confidently taking the lead and up the trail onto the golf course paved cart path and cut into the forest. Jeanie took the lead and we followed along the narrow path. It opened up onto a one lane dirt road surrounded with dense manzanita only to come upon a car working its way towards us scratching the sides of the vehicle making screeching scratching noises as it crept it's way closer to us. We stopped in surprise and RC was like: "Wow look at that"?! They pulled off the road and we passed them and set off again, commenting in all the years we have been riding out there we had never come across that before. About 20 minutes later as we had just turned onto the main gravel road here came that same car again and as they approached us from behind, RC and I stopped and I turned his head to see them and he calmly watched them drive right by him looking in the window as they passed. We trotted and strolled our way through the forest and then came across some mountain bikers with dogs and again, RC was curious about them and watched as we crossed each others paths. Our ride today was about 90 minutes long and as we rode back into our yard I savored the experience I had just had with this awesome young horse. He is everything that I have wanted in a horse and so much more. I can't remember the last time that I rode out into the forest with a horse that was so calm and confident. I sit here writing this blog and find myself filled with so much joy and appreciation for this horse and his trainer, who has helped my horse grow into such a wonderful young man. I am so excited about our future and about learning all that I can about how I can become the rider he deserves to have on his back. 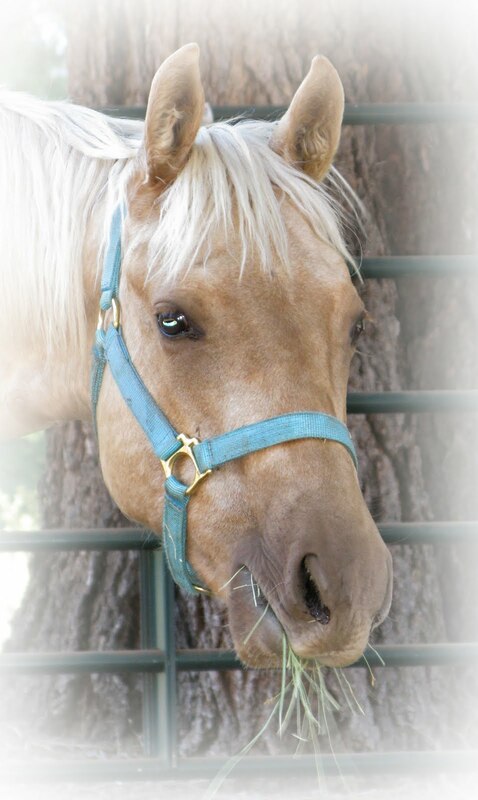 I have had a lot of people ask me lately what I wanted this horse to be or do. Each time that I am asked this question I pause and think about what do I want for him. I know that I want to have a horse who is excited to be with me, who has the confidence in me as his leader and in himself as a horse. I want a horse that can handle everything that life has to show him with curiosity and excitement. I want a horse who can head out on the trail just two of us or with a large group and be completely comfortable either way. I want a horse who is willing to try new things in life at least once with me and if we like it we will do them again. I want a horse that is going to hold me accountable for my part of the relationship and will let me know when it is time for me to step up and out to explore a new level of our abilities. That best thing about knowing what I want for this horse is knowing that together with the guidance and training from his trainer, my mentor we will accomplish all of our dreams and so much more. I truly hope that you too are following your dreams and doing what makes your heart sing! Always remember yesterday is gone and tomorrow is yet to come, all we really have is today and why not spend it with the ones you love doing what you love? Till next time, enjoy every moment as if it were the last and don't forget to dance! It's hard to believe that I have not blogged since June 9th?! Things have been going very well with RC's training. He is coming along so nicely and is really a very smart and willing horse. One of the reasons I have not written anything since the 9th is because I have been absorbing so much information from Matt that I've been at a loss about what to write. I have spent the last 10 days with house quest and have been busy enjoying family and friends while they were here. Thanks for the visit mom and dad and everyone else. Our annual Fathers day run was here in Truckee this year and we had 3 wonderful days of motorcycle riding in the beautiful Sierra mountains. Everyone has gone home now,the last to leave was my son Jack who came home for some R&R after just graduating from The Art Institute of San Francisco with a BA in Media Design. He is in the process of interviewing with a gaming company in North Carolina and I have mixed emotions about that. Of course I want him to get a job that he can enjoy and be fulfilled, I am not excited about him being so far away. We are very proud of him and he is a talented level designer and am sure he will be very successful. My Daughter; Kaydie is busy looking for apartments in Santa Barbara and will be moving in August. So as of August we will have no children living with us for the first time in 24 years and it is really kind of weird to imagine. Okay so back to RC, I have gotten to ride him 3 times so far and each time I feel a little more confident and comfortable on him. I watch he and Matt together and am in aah at how much this little guy can do with a skilled horseman on his back. He is getting stronger and more coordinated every ride, he is learning to carry himself correctly and really enjoys making the moves correctly when Matt ask him to do so. He is learning how to make his turns very smoothly and Matt is pretty excited about his ability to spin. Well I am not so sure Matt would call it a spin, however he is setting him up to do an amazing one someday! It is really fun to watch this little horse starting to ask Matt questions and looking for the right answers too. Matt is teaching me as much as possible about what he is doing with RC. It is my goal to learn all that I can from this very talented horseman. I have found that all I think about day and night is what I am learning from him and about horses. I am beginning to look at everything I do, with or without horses from a whole new perspective. I pay attention to how I move my body and where my weight is distributed when doing so and thinking about how that effects my horse and what he needs to do in order to move better. I watch how I am using my hands and how fast and hard I grab things. Wondering if I can do it softer and slower, how soft can I tap something with the end of my rope and am I micro-managing as I work with others. How is my leadership? Am I someone I would want to follow? I wake up in the middle of the night running things I have seen with Matt through my head and wondering how can I apply it, I am addicted to learning this stuff! I rode RC on Thursday while Matt was coaching me with my riding, at one point he asked me to come over to the fence where he was and side pass RC up to him. My first thought was;" oh no this is going to be hard"! So I aksed RC with my leg and weight and before I knew it he was gracefully side passing right up to Matt. I was amazed and so excited to be sitting a top a horse that was so well trained and then realizing he was mine, I could hardly contain my excitement! Matt began to tell me about what I needed to do differently and I had to stop him so I could just savor the moment I had just experienced!! I hope that soon RC and I will be ready to do our Parelli level 2 freestyle riding and submit the video for assessment and then we will be on our way to level 3. I hope to start tagging along with Matt at least one day a week so that I can watch him with a variety of horses and learn all that I can learn. Stay tuned for more of RC's adventures and I hope that you are all enjoying our wonderful summer season. Thanks for reading our updates.